I don’t know what rock I was living under last year that I missed the Simon’s Cat YouTube phenomenon, but it was only recently that I heard about the Simon’s Cat films—two days, in fact, before Hachette put out a call for bloggers interested in reviewing the book Simon’s Cat by Simon Tofield. Needless to say, I put up my hand fast, although I was a bit worried that the concept would not translate well from animated film to page. I needn’t have worried: Simon’s Cat the book is just as laugh-out-loud funny as the movies. For those of you not in the know, Simon’s cat is no ordinary cat: for one thing he has opposable thumbs and, despite being hungry much of the time, he’s not as likely to eat the mice and birds he encounters as most cats would be. 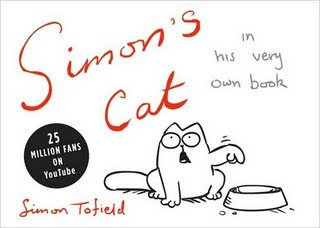 My favourite parts, however, are when Simon’s cat acts most catlike, because, to paraphrase what it says on the back cover of the book, I know (and live with) a couple of cats like Simon’s, as seen in the photos below. The funniest sequence of images for me was Simon’s attempts to get his cat into a cat carrier to take him to the vet, but it would have been cruel on my part to try to reproduce that one. I also loved how Tofield used not only traditional motion lines but also extra paws (drawn more faintly) to convey his cat’s movements. Finally, I found myself totally charmed by Simon’s cat’s odd friendship with a garden gnome. There were a couple of images I didn’t really understand, but no matter, that only means I’ll have to “read” the book again some time soon. I highly recommend this one to all the cat lovers out there! Hachette has generously agreed to sponsor a giveaway of five copies of this book on my blog! Come back on Monday for all the details. I love this review with the matching pictures! How clever and humorous! I must have been under the same rock as you, funny I missed you. This has to be one of my favorite books of the year. I think owning cats (as I do also) adds even more enjoyment. I love your cat pictures that completely match those from the book. Wonderful review. Thanks for the link! Avis I am so glad you got a copy of the book. Love that you added pics of the real cats (yours) and Simon's cat. Looks like you really related to this one! LOL! I loved that book too! It was so cute and clever, I know I'll be "reading" it again. Also, I absolutely love your pictures! Matches perfectly Simon's cat. I love your review! I adore cats too and would love this book! The pictures of your cats are great too. This would be a fun book to have. Love your review and especially love the pics of your kitties that correspond to Simon's Cat sketches, brilliant! My favorite, too, is when Simon attempts to get his cat into the carrier to go to the vet! Oh how familiar that is! I LOVE Simon's Cat and didn't realize there was a print version. I'll have to find this one! Love your review and the fact that you took pictures of your kitties to match those in the book!! Love the matching pictures. Sounds a really fun book. I've never heard about the youtube videos either! I will have to go check those out! I love how you included the photos from the book and then your own photos! Brilliant! Looks like a cute book. Cats can be so comical! This must be a big rock we all live under....I also missed Simon's Cat on you tube until last month! I just bought three copies of this book for holiday gifts. It is very funny. The main difference is that you have to interpret what is happening on your own, since THIS cat doesn't talk to the reader. :-) Simon is my favorite new cartoonist in years.